The legendary Rabo Torto can trace its ancestry back to common crosses between local Terceira Island dogs and various European breeds, most notably old English and Spanish bulldogs and mastiffs, as well as the French Dogue de Bordeaux and some bloodhounds brought to the Azores. Believed to had been a favourite dog of the pirates, the Fila da Terceira found its way into bloodlines of many breeds, as well as into the baiting and fighting arenas. Rabo Torto stands for "curled or twisted tail", describing a recognizable breed trademark, courtesy of certain bulldog strains in its ancestry. Some of the breeds influenced by the Terceira Mastiff include the Cao de Fila de Sao Miguel and the Fila Brasiliero, the latter receiving a strong Rabo Torto influx due to common migrations of people from the Azores Islands to Brazil. Standard for this impressive breed was written by a veterinarian Dr. Jose Leite Pacheco in the 1880's, who even assigned the Rabo Torto nickname as the primary name for the Fila da Terceira, but the breed was already on its way to extinction. The initially promising revival efforts in the 1960's went nowhere due to clashes between breeders and politics, leaving the breeding in the hands of farmers and island fanciers. The Terceira Mastiff was declared extinct in the 1970's, even though the dogs could still be found on farms throughout the Terceira and neighbouring islands. In recent years, there has been an increased interest concerning the breed and a new revival programme was reportedly taking place, but has since been abandoned. 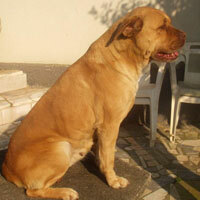 The Rabo Torto is a very muscular and powerful mastiff, best suited for experienced handlers. Dog aggressive and suspicious of strangers, it needs to be properly socialized for life in urban environments. In appearance similar to a smaller Bullmastiff or a more athletic Dogue de Bordeaux, the Terceira Mastiff is a large headed, wide chested and broad shouldered Molosser, with an attractive face, strong muzzle and a powerful neck. The ears and the naturally short, curled tail are left unaltered. The nose can be black, brown or red, while the smooth short coat should be solid-coloured in shades of yellow, tan and fawn with a dark mask, but there are some red, black and brindled dogs to be found, generally viewed as unpure by the breed authorities. Small white markings on the chest and feet are permissible. The average height is around 22 inches. sadly but its and extinct breed. last register dogs date of 1940's. The Red Necklaces worn by Tibetan Mastiff to protect them from predators and to distinguish them from a distance. One of the ancient molosser and very popular. Believed by some to be a direct descendant of the war dogs brought to India by Alexander the Great in 300 B.C.